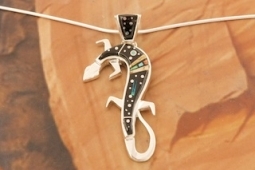 Amazing Night Sky Gecko Pendant with Shooting Star by the Famous Navajo Artist Calvin Begay. Genuine Acoma Jet and Picture Jasper inlaid in Sterling Silver. Free 18" Sterling Silver Chain with Purchase of Pendant. Signed by the artist.